We will collect and use the data you provide on our contact forms for the intended purpose only. We are not using any 3rd party analytics tool. We do not share your data outside of our company. At this time, the visitor registration and comment functions are not enabled. The respective remarks are not valid. 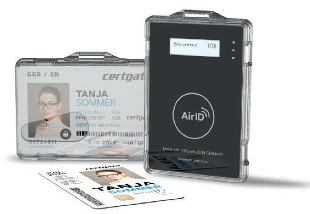 Ergonomics now distributes the AirID2, the innovative Bluetooth reader from the German IT security specialist certgate. The wireless card reader in the credit card format fits perfectly into the range of security and authentication solutions of Ergonomics, with which it is of course also compatible. Leveraging IDEX's market leading off-chip biometric sensor technology, Feitian has developed a contact and contactless smart card for use in a variety of government ID, access control and payment use cases. The rapid card prototyping has been enabled by the provision of a complete biometric module from IDEX. Thales, a leader in critical information systems, cybersecurity and data security, announces its nShield XC hardware security modules (HSMs) and Vormetric Application Encryption solution are now certified to Federal lnformation Processing Standard (FIPS) 140-2. Validation to FIPS 140-2 is a mandated requirement in many industry and government sectors and is a frequently stated best practice for organizations seeking to protect sensitive data. Copyright ©2019 Ergonomics AG, Zürich. All Rights Reserved.